Dr Neville is a mental health nurse with an established research profile in ageing, dementia, mental health and respite care using predominantly quantitative research methods. Her current research focus is on the benefits of aquatic exercise for people with dementia particularly its influence in the management of behavioural and psychological symptoms of dementia. She developed the internationally renowned Watermemories Swimming Club. Additional research interests include family centred counselling for carers of people with dementia, pain in older people with dementia and respite care for older people with dementia. Dr Neville has general and mental health nursing qualifications with extensive clinical experience in both these areas. Her PhD was undertaken at The University of Queensland on the behaviour of older people admitted for respite care. She is a Fellow of the Australian College of Mental Health Nurses and has been the recipient of the internationally acclaimed Stan Alchin Award for Outstanding Mental Health Nursing Practice. Christine is President of the Psychogeriatric Nurses Association. Since 1997 she has been involved in the tertiary education of nurses. 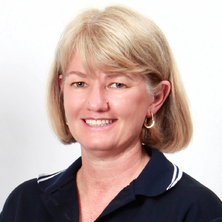 Christine joined The University of Queensland in the School of Nursing and Midwifery in 2007 and is the Deputy Director of UQ Ipswich Clinical School. She developed UQ's first Master of Mental Health Nursing program and is the Co-ordinator. Behavioural and psychological well-being of people with dementia and their carers. Pain management for people with dementia. The benefits of respite care for people with dementia and their carers. The benefits of exercise for people with dementia. Family centred care for people with dementia. The role of mental health nurses in the care of people with a mental illness. Older persons mental health care. The Watermemories Swimming Club (WSC) for people with dementia was successfully piloted during 2011 with significant benefits of reduced psychological distress, less behavioural and psychological symptoms of dementia (BPSD) and better staff reactions to BPSD. There has been intense media, national and international interest in the WSC. The WSC has brought about a fundamental change in peoples' attitudes as to what people with dementia can and cannot do whether they live at home or in a residential aged care facility. People with dementia should be able to do what other people usually do. If they enjoy swimming, there is no reason why they should not go swimming at the local municipal pool where other community members go swimming. However, to make the effort successful and worthwhile a number of arrangements and processes have to be put in place to support people with dementia and their carers, for example, what to do about incontinence, safe entry in the pool, how much assistance a person would need etc. All this information is detailed in a manual which includes the dementia-specific exercise program (e.g., simple, repetitive exercises that target key muscle groups to prevent falls and maintain function; fun activities for enjoyment and relaxation). Project outcomes include journal publications, DVD, manual and a training program for instructors and pool pals. The project ‘Review, present and develop contemporary National Standards and clinical indicators for mental health nursing’ was significant as the results of this work were adopted by the Australian College of Mental Health Nurses to produce the 'Standards of Practice for Australian Mental Health Nurses: 2010'. This publication was formally launched by the Tasmanian Minister for Health at the Australian College of Mental Health Nurses 36th Annual International Conference, Hobart, 2010. These standards are used by many local, state, national and international organisations and Universities to determine standards of mental health nursing care. Additionally, the new standards are used as a benchmarking tool, for example, the Australian College of Mental Health Nurses published the Scan of Postgraduate Mental Health Nursing Programs in Australia 2011, to assist with the credentialing for practice program. Within this publication, the 'Standards of Practice for Australian Mental Health Nurses: 2010' were used to as a benchmark for the quality of postgraduate mental health nursing programs offered throughout Australia. The new standards will contemporise and inform mental health nursing care in Australia for at least another decade. The respite care research program has had a number of influences on policy and practice as it included the first ever Australian study to report on the prevalence of behavioural and psychological symptoms exhibited by older people in the community and residential respite care settings. It informed the Report to the Minister for Ageing on Residential Care and people with Psychogeriatric Disorders (2008) from which the federal government provided $2 million for NHMRC research grants into the care and treatment for psychogeriatric disorders. Data and research results were used to assist in the evaluation of the impact of the federally funded EACHD program on people with dementia and their carers. It also informed Alzheimer Australia’s discussion paper ‘Respite for People Living with Dementia: 'It’s more than just a short break' (2009). This report made recommendations to government and industry to improve the quality and uptake of respite care for older people with dementia and their family carers. This research also formed the basis of the Respite Care in Dementia: Consumer Perspectives study which was the first national survey of carer's experiences with respite care which had significant policy recommendations relevant to the Australian Government's 'Living Longer. Living Better' reform package. A Social Constructionist Appreciation of the mental health inpatient nursing care for people with intellectual disability. The prevalence of dementia is one of the most important issues facing Australia this century with significant personal, social, economic and health reverberations across the nation. People with dementia who live in residential aged care facilities are often physically inactive and exhibit behavioural and psychological symptoms of dementia (BPSD). Physical inactivity is associated with increased risk of all causes of mortality, sarcopenia, decline in mood and activities of daily living. This project builds on successful pilot work which demonstrated that aquatic exercise had a significant positive impact on the person with dementia’s physical and psychological wellbeing, BPSD and carer reactions to BPSD. Most of the care for people with dementia is provided by family members at home. Caring is physically and psychologically stressful, often causing debilitating feelings of anxiety, loneliness, guilt and failure. As dementia progresses, family carers are increasingly vulnerable to stress and depression, which may lead them to reluctantly place the person with dementia in a residential aged care facility (RACF). In a 20-year randomized controlled trial in the USA, a program called the New York University Caregiver Intervention (NYUCI) provided counselling to spouse carers and their family members and demonstrated that such support reduced carer depression and reactions to the behavioural and psychological symptoms of dementia and improved carer physical health, compared to usual care. This in turn led to a significant delay (1.5 years, on average) in admission of their family member into a RACF. The major mediator of these outcomes is improved support from family and friends. Phase 2 (2013: 12 months): Community health workers who are employed by Blue Care will be invited to participate. Participants will undergo training in the NYUCI (Aus) over 12 weeks (March –June 2013). They will devote 3 hours each week for reading and online learning. Additionally, they will link up (via online discussion boards, email, Skype) with a peer mentor from the USA with experience in the NYUCI. Phase 3 (2014: 18 months): 120 carers will be offered the opportunity of participating in the NYUCI (Aus) program We will evaluate the effectiveness of the NYUCI (Aus) in improving the mental and physical health of carers and in postponement in the use of residential aged care for the person with dementia. Neville, C., Eley, D., Hangan, C ., Weir, J., Quinn, J. and Meehan, T. Standards of Practice for Australian Mental Health Nurses: 2010. Edited by P. Marks Canberra, ACT, Australia: Australian College of Mental Health Nurses, 2010. Byrne, Gerard J.A. and Neville, Christine Community mental health for older people. Chatswood, NSW, Australia: Elsevier Australia, 2009. Neville, Christine, Eley, Diann, Hangan, Catherine, Weir, Jim, Quinn, John and Meehan, Tom New Standards of Practice for Australian Mental Health Nurses. Australia: University of Southern Queensland, 2009. Neville, Christine C., Cleary, Marie F. and Slykerman, Mary A. Lutheran community care: Model of care. Toowoomba, Qld., Australia: Centre for Rural and Remote Area Health, 2005. Neville, Christine, McCarthy, Alexandra and Laurent, Kathryn The development of pain assessment and management skills in regional nurses caring for cognitively impaired older people: A needs analysis. Darling Heights, Qld, Australia: Centre for Rural & Remote Area Health, 2003. Christine, Neville (2017). Mental Health Care. In Australian and New Zealand Fundamentals of Nursing: Standards & Practice (pp. 488-501) Sydney, Australia: Cengage. Neville, Christine and Byrne, Gerard (2014). Depression and suicide in older people. In Rhonda Nay, Sally Garratt and Deirdre Fetherstonhaugh (Ed. ), Older People: Issues and innovations in Care 4th ed. (pp. 267-284) Chatswood, NSW, Australia: Churchill Livingstone. Neville, Christine C. and Byrne, Gerard J. A. (2009). Depression and suicide in older people. In Rhonda Nay and Sally Garratt (Ed. ), Older people: issues and innovations in care 3rd ed. (pp. 229-243) Chatswood, NSW, Australia: Churchill Livingstone Elsevier. Neville, Christine (2016) Danger ahead: residential respite care underway. Residential Aged Care Communique, 11 1: 5-6. Neville Christine (2015) Systematic review summary: smoking cessation interventions for smokers with current or past depression. Singapore Nursing Journal, 42 1: 43-44. Neville, Christine (2015) Testing the water: swimming club makes exercise a joy. Australian Journal of Dementia Care, 4 6: 17-20. Neville, Christine (2014) Psychological therapies for people with borderline personality disorder. Nursing Times, 110 4: 25-25. Neville, Christine (2013) Body of evidence. Mental Health Practice, 17 4: 11-11. Fielding, Elaine, Beattie, Elizabeth, Gresham, Meredith, Neville, Christine and Readford, Margaret (2012) Building better respite: hearing the voice of carers. Australian Journal of Dementia Care, 1 4: 16-18. Neville, Christine and Goetz, Sandra (2012) Mastering mental health nursing. Australian Nursing Journal, 20 2: 36-36. Neville C. C., Yuginovich T. and Boyes J. (2008) A stock-take of existing aged care clinical placements for undergraduate nursing students in Australia. Australian Journal of Advanced Nursing, 26 2: 17-26. Neville, C. and Hangan, K. (2007) Mental health nursing to benefit for research. Queensland Nursing Forum, 15 1: 27-27. Who’s going to care? Informal care and an ageing population. Boyes, Joanne and Neville, Christine (2007) Incentives needed for nurse educators. The Australian Nursing Journal, 14 7: 34-34. Neville, Christine C. and Byrne, Gerard J. A. (2002) Behaviour of Older People Admitted for Residential Respite Care. Australian Journal of Advanced Nursing, 20 1: 8-12. Neville, Christine C. and Byrne, Gerard J.A. (2002) Behaviour of older people admitted for residential respite care. Australian Journal of Advanced Nursing, 20 1: 8-12. Behaviour rating scales for older people with dementia: Which is the best for use by nurses? Neville, Christine C. and Byrne, Gerard J. A. (2001) Behaviour rating scales for older people with dementia: which is the best for use by nurses?. Australasian Journal of Ageing, 20 4: 166-172. Neville, C. (1995) Community mental health nursing and the elderly client: A case presentation. Australian and New Zealand Journal of Mental Health Nursing, 4 4: 190-195. Rosenfeld-Lovell, D., Brown Wilson, C., Scott, T. and Neville, C (2015). Psychosocial interventions for older people experiencing depression in aged care facilities: a systematic review. In: 3rd NUS-NUH International Nursing Conference & 20th Joint Singapore-Malaysian Nursing Conference, Singapore, Singapore, (). 18-20 November 2015. Elias, Sharifah Munifah Syed, Neville, Christine and Scott, Theresa (2015). Reminiscence Therapy for older people suffering from loneliness, anxiety and depression: a review of the literature. In: The Asian Conference on Psychology & the Behavioral Sciences 2015: Official Conference Proceedings. The Fifth Asian Conference on Psychology and The Behavioral Sciences, Osaka Japan, (1-17). 26-29 March, 2015. Taua, Chris, Neville, Christine and Scott, Theresa (2014). Capacity, information and voluntariness: the realities of gaining consent. In: ASID NZ 2014 Conference: Research to Practice, Hamilton, NZ, (). 9-10 April, 2014. Neville, C., Scott, T., Beattie, E., Parker, D. and Mittelman, M. (2014). Evaluation of an internet-based self-directed educational program to facilitate learning and competence in delivery of the NYU Caregiver Intervention to Australian carers: learner perspectives. In: DCRC 2014 National Dementia Forum Abstracts. DCRC2014: 8th National Dementia Research Forum 2014, Sydney, NSW, Australia, (31-32). 18 September, 2014. Neville, Christine (2014). Incontinence: the psychosocial impact. In: Continence Foundation of Australia Queensland Branch State Conference, Brisbane, QLD, Australia, (). 14 March, 2014. Zamora, Angelique and Neville, Christine (2014). The Watermemories Swimming Club. In: West Moreton Dementia Network, Ipswich, Qld, Australia, (). 5 February 2014. Taua, Chris, Neville, Christine and Hepworth, Julie (2013). "If it doesn't work, try a different way": exploring the nurses role in dual disability (mental health and intellectual disability). In: MHN 13: 1st Australasian Mental Health and Addiction Nursing Conference, Auckland, New Zealand, (). 19-21 June, 2013. Neville, Christine (2013). Authorship and publication agreements. In: Writing Space for Publication, North Keppel Island, QLD, Australia, (). 7-8 September, 2013. Neville, Christine and Taua, Christine (2013). Collaborative research: navigating consent for people with diminished capacity. In: ACMHN 2013: 39th International Mental Health Nursing Conference. Collaboration and Partnership in Mental Health Nursing, Perth, WA, Australia, (25-25). 22-24 October, 2013. Neville, C. and Goetz, S. (2013). Engaging students in a mental health undergraduate nursing course: utilising an online Problem Based Learning approach. In: Inaugural ACMHN International Online Research Symposium: Evidence-based Practice, Canberra, ACT, Australia, (). 19 April, 2013. Scott, Theresa, Neville, Christine, Mittelman, Mary, Beattie, E. and Parker, D. (2013). Enhancing quality of life of carers of people with dementia: knowledge transfer and training of healthcare professionals. In: DCRC-CC: 7th National Dementia Research Forum 2013, Brisbane, QLD, Australia, (). 21-22 September, 2013. Neville, Christine (2013). Flying high: choosing the right journal. In: HEALTH Collaborative Research Network, Rockhampton, QLD, Australia, (). 7-8 September 2013. Neville, Christine (2013). How to write. In: HEALTH Collaborative Research Network, Rockhampton, QLD, Australia, (). 7-8 September 2013. Neville, Christine, Mittelman, Mary, Scott, Theresa, Beattie, Elizabeth and Parker, Deborah (2013). NYUCI(Aus): supporting carers of people with dementia. Translating the New York University Caregiver Intervention for an Australian workforce and consumers. In: West Moreton Hospital and Health Service Research Day 2013 Abstract Booklet. 4th Annual West Moreton Hospital and Health Service Research Day, Ipswich, QLD, Australia, (47-47). 18 October 2013. Neville, Christine (2013). Nursing and global aging: the Australian perspective. In: 20th IAGG World Congress of Gerontology and Geriatrics, Seoul, South Korea, (). 21-23 June, 2013. Taua, C. and Neville, C. (2013). People with intellectual disability consenting to research. In: 2013 Annual Research Meeting. Schizophrenia Research Group, Auckland, New Zealand, (). 18-19 November 2013. Neville, Christine (2013). Physical activity as a non-pharmacological intervention for people with dementia. In: IPA 2013: 16th International Psychogeriatric Association International Congress, Seoul, Korea, (S31-S31). 1-4 October, 2013. Neville, Christine (2013). Responding to reviewers. In: Writing Space for Publication, North Keppel Island, QLD, Australia, (). 7-8 September, 2013. Zamora, Angelique and Neville, Christine (2013). The Watermemories Swimming Club. In: Alzheimer's Queensland, Ipswich, Australia, (). 19 February 2014. Neville, Christine (2013). The Watermemories swimming club. In: International Dementia Research Scholars Collaborative, Virginia, USA, (). 29-31 May, 2013. Neville, Christine, Fielding, Elaine, Beattie, Elizabeth, Readford, Margaret, Gresham, Meredith and MacAndrew, M (2013). The prevalence of behavioural and psychological symptoms of dementia in people living at home with their families. In: The Tiles of Life: Alzheimer's Australia Fifteenth National Conference. Alzheimer 2013: Alzheimer's Australia 15th National Conference, Hobart, TAS, Australia, (48-48). 14-17 May, 2013. Taua, C., Neville, C. and Hepworth, J. (2012). Confidence as the imperative outcome: designing a graduate course for nurses working with people with dual disabilities. In: Pacific Rim International Conference on Disability and Diversity, Honolulu, Hawaii, (). 26-27 March 2012. Fielding, E., Neville, C., Beattie, E., Readford, M. and Gresham, M. (2012). Correlates of burden and depression in carers of people with dementia in the community. In: IPA International Meeting, Cairns, QLD, Australia, (). 7-11 September 2012. Neville, C. (2012). Current dementia research: A tale of three studies. In: The HACC ‘Community Care for the Future’ Forum, Toowoomba, Qld, Australia, (). 24th May 2012. Taua, Chris, Neville, Christine and Hepworth, Julie (2012). From rhetoric to action: consent and participation strategies for people with intellectual disability having a voice in research. In: 47th Annual Conference for Australasian Society for Intellectual Disability: Research to Practice, Wellingon, New Zealand, (). 7-9 November 2012. Neville, C. (2012). Pain rating scales for people with moderate to severe dementia. In: Queensland Dementia Training Study Centre, Brisbane, Australia, (). 20 March 2012. Neville, Christine (2012). Psychosocial and behavioural considerations. In: Abstracts for the 8th World Congress on Aging and Physical Activity. 8th World Congress on Aging and Physical Activity, Glasgow, Scotland, (S9-S9). 13-17 August 2012. Beattie, Elizabeth R. A., Fielding, Elaine L., Readford, Margaret, Neville, Christine and Gresham, Meredith (2012). Respite care in dementia: consumer perspectives. In: 23rd International Nursing Research Congress, Brisbane, Australia, (). 30 July - 3 August 2012. Neville, C. (2011). Better mental health care for people living in residential aged care facilities. In: Aged Care Standards and Accreditation Agency Better Practice Conference, Adelaide, Australia, (). 27-28 July 2011. Neville, Christine and Tuckett, Anthony G. (2011). Geriatric mental health nurses' ranking of imporance of caring behaviours. In: Reinventing Aging through Innovation, Care, Research, Technology. 15th International Psychogeriatric Association (IPA) International Congress, The Hague, The Netherlands, (). 6-9 September 2011. Neville, C. and Tuckett, A. (2011). Geriatric mental health nurses’ ranking of importance of caring behaviours. In: Ipswich Hospital Research Day, Ipswich, QLD, Australia, (). 20 October 2011. Neville, C. (2011). Geriatric mental healthcare: Towards an understanding of nurses' most important caring behaviours. In: Reinventing aging through innovation. Abstracts of the International Psychogeriatric Association 15th International Congress. 15th International Psychogeriatric Association, The Hague, The Netherlands, (S354-S354). 6-9 September 2011. Neville, C. and Dickie, R. (2011). Nursing older people – The student’s perception. In: Ninth Asia/Oceania Regional Congress of Gerontology and Geriatrics, Melbourne, Australia, (). 23-27 October 2011. Fielding, E., Beattie, E., Neville, C. and Gresham, M. (2011). Respite care in dementia: Consumer and provider perspecitives. In: National Dementia Research Forum 2011, Sydney, Australia, (). 22-23 September 2011. Neville, C., Beattie, E., O’Reilly, M., Fielding, E. and Gresham, M. (2011). Respite care: The impact of a changed environment on older people and their carers. In: International Psychogeriatric Association (IPA) 15th Congress, Hague, Netherlands, (). 6-9 September 2011. Neville, C. and Ostini, R. (2011). Using pain rating scales in residential aged care facilities. In: Alzheimer's Australia 14th National Conference, Brisbane, Australia, (). 17-20 May 2011. Taua, C., Neville, C. and Hepworth, J. (2010). People with intellectual disability as active participants in nursing research: a literature review. In: 3rd International Association for the Scientific Study of Intellectual Disabilities - Europe Congress, Rome, Italy, (). 20-22 October 2010. Understanding care relationships: A comparative study in mental health and intellectual disability. Taua, C, Neville, C and Hepworth, J (2010). Understanding care relationships: A comparative study in mental health and intellectual disability.. In: Colin Slade and Robyn Priest, Building Bridges National Community Mental health and Addictions: Transcending Barriers, cultures and differences in our approach to community mental health and addiction services, Wellington Convention Centre, New Zealand, (). 14-16 April 2010. Goetz, Sandra, Neville, Christine, Fox-Young, Stephanie and Neale, Kerry (2009). Dealing with students' concerns about work related practice in mental health settings. In: Blended Learning Conference 2009. Blended Learning Conference 2009, St. Lucia, Qld., Australia, (1-18). 18 June 2009. Neville, Christine (2008). Mental health nursing care for older people in developing countries. In: International Journal of Mental Health Nursing. 34th Annual Conference of the Australian College of Mental Health Nurses, Melbourne, Australia, (A26-A26). 6-10 October, 2008. Neville, Christine and Hangan, Catherine (2008). Positive reinforcement: Developing practice indicators and benchmarking tools for mental health nursing. In: International Journal of Mental Health Nursing. unknown, unknown, (A26-A26). unknown. Neville, Christine, Cleary, Marie and Slykerman, Mary (2005). Identifying a model of care for aged and disability services. In: 38th National Conference of the Australian Association of Gerontology Abstracts. 38th National Conference of the Australian Association of Gerontology, Gold Coast, QLD, Australia, (A41-A41). 9-11 November 2005. Aged Care in the Future and Baby Boomers: Shall the Twain Ever Meet? Fallon, Anthony Bruce, Price, Kay, Hegney, Desley, Abbey, Jennifer, Neville, Christine, Oxlade, Deborah and Soar, Jeffrey (2004). Aged Care in the Future and Baby Boomers: Shall the Twain Ever Meet?. In: Conrick, Moya and Soar, Jeffrey, ACCIC 2004 Proceedings Papers: First Australian Aged and Community Care Informatics Conference. Aged and Community Care Informatics Conference, Brisbane, Australia, (49-53). 24-25 August, 2004. Building bridges: collaboration in health care. Refereed conference proceedings (1999) . Edited by Mary Beth De la Rue, Kristine Martin-McDonald and Christine Neville. Building bridges: collaboration in health care, 1-2 December, 1998, Toowoomba, QLD, Australia. Neville, Christine, Yuginovich, Trudy, Fallon, Anthony, Soar, Joanne and Grasby, David (2006) A stock-take of existing aged care clinical placements for undergraduate nursing students in Australia. , Centre for Rural and Remote Area Health, University of Southern Queensland; University of Queensland. Neville, Christine C. (2004). The impact of residential respite care on the behaviour of older people PhD Thesis, School of Health and Rehabilitation Sciences, The University of Queensland. Pain rating scales for older people with severe dementia: which is the best for nurses to use?